Evan Evans boasts a fantastic signage industry reputation and is proud to be a leading supplier of banners and flags in Australia. Using cutting-edge digital printing equipment, we can manufacture a wide range of signage products that include real estate flags, corflute signs, vinyl floor stickers, A-frame signs, and flags – including Aboriginal flags. If you’re looking to purchase an Aboriginal flag, Evan Evans has you covered with top quality printed trilobal or fully sewn flags available in various sizes. When you buy an Aboriginal flag from Evan Evans, you can rest assured it’s going to last. Designed by artist Harold Thomas, the Australian Aboriginal flag first flew in the state of South Australia in Adelaide’s Victoria Square on July 12th (National Aborigines Day). Since the early 1970s, the flag has become a well recognised symbol of the unity and unique identity of Australia’s indigenous people. Due to the Aboriginal flag’s wide acceptance by the Australian society, it was officially given legal recognition in 1994, and the following year it was announced a Flag of Australia. 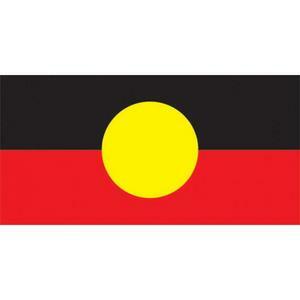 Black – The black top half of the flag represents the country’s Aboriginal people. Yellow circle – This represents the sun, which is seen as the giver of life and a protector. Red – The red lower half of the flag represents the red ochre colour used in Aboriginal ceremonies. It also represents Australia’s famous red earth and the country’s indigenous peoples’ spiritual relation to the land.